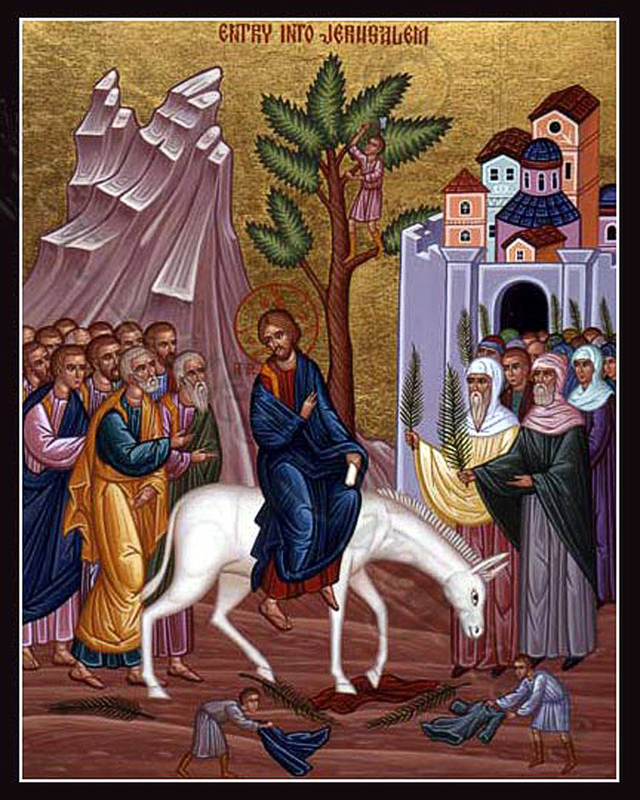 The collect and readings for The Sunday of the Passion: Palm Sunday, Year B, may be found here. The following sermon is based on Mark 11:1-11 and Philippians 2:5-11. Today is a strange mixture of gospel readings, emotions, and contrast. We began with a parade; shouts of “Hosanna,” a declaration of praise and a cry for salvation; and the waving of palms, the ancient symbol of victory and triumph. We end with a death march, a cry of forsakenness, and a last breath. The liturgy is holding before us the reality of our world and our lives. We know what it’s like to live in the tension of victory and defeat, joy and sorrow, life and death. At the center of this tension lies Jerusalem, Jesus’ destination. Today marks Jesus’ entry into Jerusalem. It is a threshold place and it is the most troubled place in the world; a place of division, struggle, conflict, and confrontation. Jerusalem, however, is not located only in Israel. Within every human heart there is a Jerusalem. Jesus’ entry into Jerusalem is then, in reality, his entry into the depths of our life and being. This is never more clear or challenging than it is in Holy Week. It is not about choosing between life or death, palms or passion; but about choosing life and death, palms and passion. That’s the tension of this day. The challenge is to remain fully embodied and present to that tension, not as spectators but as participants, not just this week but every week. Jesus was not quick to resolve the tension, nor should we be. It is out of that tension that new life will ultimately be birthed. There is, however, no birth without pain. To stand in the tension means we must choose to empty ourselves of anything that might keep us from fully embracing the events of this week and the life of God. That’s what Jesus did. He did not use his status as God’s son as an escape or something to be exploited. Instead he emptied himself and chose obedience to the point of death. In so doing he fully embodied God’s life and, consequently, human life. Self-emptying allows full embodiment and presence. That is the triumph and victory of this day. There is, however, more to Jesus’ entry into Jerusalem than today’s first gospel reading. Jesus will enter Jerusalem four times this week. With each entry, Jesus empties himself and is more fully present than he was the time before. In the first entrance, today’s reading, Jesus comes to Jerusalem, goes to the temple, looks around and leaves. The next day, Monday, he returns to Jerusalem, the second entrance, and cleanses the temple, overturning the tables and chairs of the money changers and merchants. Again, he leaves Jerusalem. The following day, Tuesday, Jesus goes to Jerusalem and enters the temple a third time. He teaches and again leaves. Thursday is Jesus’ fourth entry. He comes back to Jerusalem with his disciples to eat the Passover meal. These four entrances are distinct but not separate. Their unity is found in the self-emptying that allows Jesus to more fully embody and be present to God’s life. If this is Jesus’ entry into Holy Week, then it must also be ours. Each of Jesus’ entrances calls us to enter into the depths of our own heart, for that is where Holy Week happens. Each entry offers us a means by which we might more fully embody and be present to the life of God within us. Upon his first entrance, Jesus looks around the temple, turns and leaves. There’s nothing there for him. It is bereft of life, like a fig tree that produces no fruit. It offers no meaning. There is nothing worth staying for. You and I know those places too. They are physical places as well spiritual and emotional places. We often stay there longer than is good for us. Sometimes there are simply places from which we must turn and leave. They offer us nothing and only drain us of life. They are not fruitful places for us. Leaving these places is how we turn our life towards God. Jesus refuses to buy in to the status quo during his second entrance into Jerusalem. This entry asks us to consider what needs to be purified and cleansed in us; thoughts, words, actions. How has our life become a series of transactions rather than relationships of intimacy, vulnerability, and love? In what ways have we become gatekeepers of life and faith, demanding rather than offering obedience? It is not enough, however, to just clean out and throw away. Jesus’ third entry fills the temple with his own interior wisdom. He challenges us to consider what teaching and wisdom guide and fill our life. Is it only external rules of behavior, or is it also sacred knowledge that transforms and leads to God? Have we let the same mind be in us that was in Christ Jesus? Jesus enters Jerusalem a fourth time to share the Passover meal with his disciples. It is a night of tension. Jesus not only eats the Passover he will become the Passover. He shares himself to the point of allowing himself to be betrayed. He risks it all. His fourth entry is our call to self-giving, to hold nothing in reserve, to offer all that we are and all that have. What are the parts of ourselves we hold back and hide from God and others? Do we live by fear or by faith? Each entry asks of us difficult questions, real-life questions. We must engage life with brutal honesty and move past superficial niceties. We must empty and embody. We can do that only because with each entry, Jesus empties himself that he might more fully embody and reveal God’s self. He detaches from the temple structure. He cleanses and purifies the old ways. He interiorizes God’s law and teaching. He becomes holy food for holy people. Each time he is more fully himself than he was the time before. Each entrance is a form of dying. Jesus was killed on the cross but he died in the triumphal entry. He empties that he might embody. So it is for us too. Emptying and embodying are the way of Jesus and the way of this holy week. Emptying and embodying are Jesus’ entry into humanity’s heart. Emptying and embodying are our way into God’s heart. Thank you Br. James. I appreciate your friendship and encouragement. So grateful you post your sermons. Even when life’s timing is such that I can be present to hear them in person, it is a large help to be able to sit, read and ponder. Many thanks. Blessings! Hi Cecily. I am glad your find the sermons helpful. I hope you are well and look forward to seeing you. I’m always a bit frustrated on Palm Sunday when we read the entire Passion narrative … it tempts us to jump straight to Easter without experiencing all of Holy Week. While I do observe Maundy Thursday and Good Friday, your words make me realize how important it is to consciously reflect on the events of the other three days. Thank you, Mike. Ellen, I agree we sometimes move through Holy Week too quickly. Instead we need to slow down and let it move through us. I hope you have a blessed Holy Week. Jesus entering Jerusalem for the passover is fulfilment of the very first passover in Exodus 12. On the tenth of this month every man shall take for himself a lamb Your lamb shall be without blemish, a male of the first year. You may take it from the sheep or from the goats. Now you shall keep it until the fourteenth day of the same month. Then the whole assembly of the congregation of Israel shall kill it at twilight. Thus the lamb was with them four days before being sacrificed for the Passover … Jesus entered Jerusalem four times as the ‘Lamb of God’ as declared by John The Baptist (John 1:29). Jesus is tested by the Pharisees and truly is ‘found without fault’ (without blemish). Jesus is our deliverance from spiritual death through sin just as the Passover Lamb was deliverance from physical death of the firstborn of Egypt … ‘For I will pass through the land of Egypt on that night, and will strike all the firstborn in the land of Egypt, both man and beast; and against all the gods of Egypt I will execute judgment: I am the Lord. (Exodus 12). This is a foreshadow of our Lord and Saviour Jesus Christ who gave Himself to death, burial and resurrection … All Praise & Glory be to our Lord … Amen. Love & Blessings … Chris.